A year from today, April 14, 2012 will be the 100th anniversary of the sinking of the Titanic. During the year leading up to this anniversary, I will be preparing all the dishes offered as part of 1st Class dinner menu from that fateful night. This will culminate in me preparing the entire 11 course meal for a group of friends to mark the 100th anniversary. My resource will be one of my favourite books, Last Dinner on the Titanic, by Rick Archbold & Dana McCauley. This book is a treasure of information about the food and food preparation on the Titanic.The book contains original menus, authentic recipes, beautiful illustrations and photos. 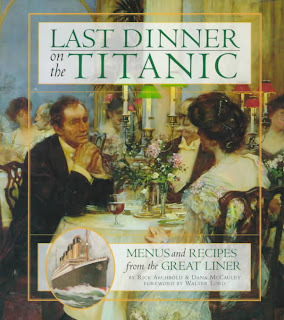 This book accurately re-creates what it was like to dine on the Titanic. Over fifty dishes are featured from the Titanic's menus and each recipe has been researched from period sources and carefully tested for modern kitchens. It's a fascinating book and the inspiration for my project. I'm very excited about this project and I hope you'll enjoy the journey with me. 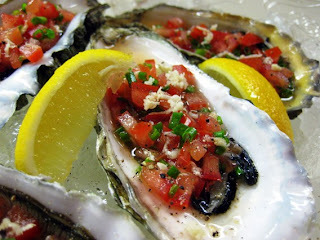 The first recipe I've done is an Hors D'Oeuvre....Oysters a la Russe. I love the relish with a kick of vodka and horseradish. A refreshing and perfect start to any elegant dinner. 1. In bowl, stir together vodka, lemon juice, horseradish, hot pepper sauce, sugar, salt. 2. Gently stir in tomato and chives. 3. Wash oysters under running water to remove any loose barnacles or sand. Insert tip of oyster shucker between shell halves near hinges; twist upward to open shell. Discard top shell, Using blade of shucker, sever connective membrane that holds oyster to bottom shell. Place open oysters on bed of shaved or crushed ice. 4. 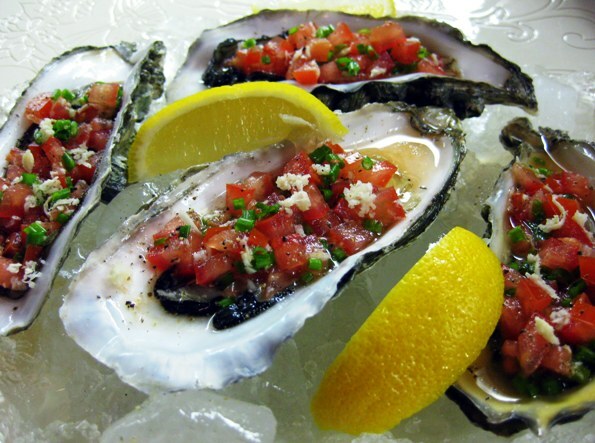 Spoon vodka relish over each oyster; dusting with cracked pepper. * The Titanic hit the iceberg at 11:40pm on April 14 1912, and completely sank at 2:20 the following morning, April 15, 1912. The dinner I'll be recreating was served on the evening of April 14th. Paula, what a great concept, I love it. Where do I apply to be your friend? You always have the best ideas for a dinner party Paula! This is such a wonderful idea. I've always been fascintated by all things Titanic. I heard on the news this morning that there is a group that gathers every year on the anniversary of the sinking of the Titanic and they share the last meal together that the passengers had on board the ship. I'll be watching for your recipes! What a fabulous project. Looking forward to your posts! What a great idea. I'm going to follow along, enjoying vicariously the entire way! Those oysters look fabulous, by the way. I too am doing this but only 6 courses and the sea biscuts from 2nd class as well(same book). Yours sounds like a great time with friends... mine will be for 150-200(event with music etc. in Fond du lac WI for the historical society)- some frends hope by the end of the evening all friends and no foes... say a prayer.. I'd LOVE to be able to do these recipes but I'm allergic to gluten and horseradish and I won't ever be able to eat most of it! But what a wonderful thing, to have all the recipes for this meal!